Take a quick trip by bus or cable car to this luxurious island resort for plenty of attractions to entertain both young and old. 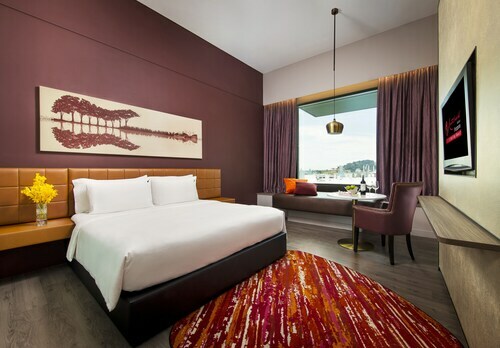 Located a mere 800 metres from the coast of Singapore, the resort island of Sentosa is the ultimate in family-friendly indulgence. Boasting museums, golf courses, theme parks, and some of the finest beaches and wildlife in the area, it really is no exaggeration to say that Sentosa has something for absolutely everyone. While there are a number of buses running from the mainland to Sentosa, by far the most exciting way to get here is via cable car. This deposits passengers on one of Sentosa's highest points, Imbiah Lookout, for stunning views back across the water to Singapore city centre. For even more spectacular views, head to the Tiger Sky Tower which will whip you 131 metres up into the sky, or try a trip to the giant Merlion statue – a mythical lion-heded fish and icon of the island, from whose mouth you'll get a 360-degree view of the surrounding landscape. After a morning visit to Images of Singapore, where impressive multimedia displays convey the history of the country, followed by a wander through the flutterings of the Butterfly Park, settle yourself down on the beach and chill out for a few hours. Sentosa is home to 2 kilometres of protected coastline – some of the nicest in Singapore. While these stretches aren't the best for swimming, they are a great spot to laze in the sun or sample the local cuisine with your toes in the sand. If you fancy something ever so slightly more active, Sentosa Golf Club boasts two 18-hole championship courses, not to mention a decadent clubhouse. Alternatively, if you have the kids in tow, nothing will bring a smile to their faces like a trip to Universal Studios Singapore, one of the most popular theme parks in all of Asia. Or, you could take them on a visit to the Underwater World and Dolphin Lagoon for a closer look at marine life ranging from sharks to turtles. 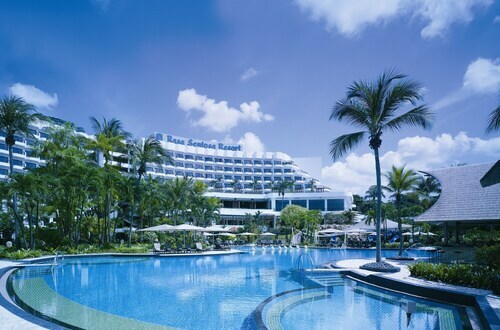 The Sentosa resort is less than a kilometre from Singapore. You can get here by monorail or bus from the VivoCity Center, or hop on the cable car at Mount Faber or the Harbourfront Centre. Admission to the island is included in the cost of your transport. Combining Singapore's natural beauty and human ingenuity, this is one of the city's most unique attractions. Wander through tropical rainforest, marvel at a myriad of cultivated orchids or picnic in the leafy shade – and all right in the centre of Singapore city. Experience the ethereal beauty of orchids in their thousands as you wander around one of the world's most extensive collections of this delicate flower. Get back in touch with nature on this unspoilt island and experience the final remnants of what Singapore was like in simpler times. 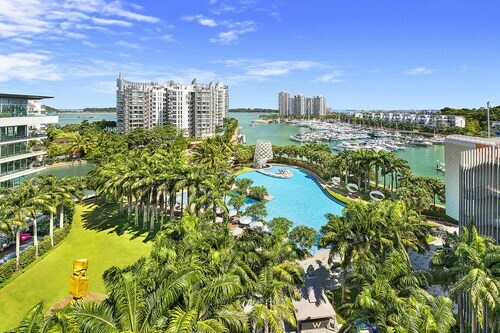 Direct access to the beach, this Sentosa Island resort is within 20 Km (12 miles) from Mainland Singapore's Suntec Convention Center, the island's Sentosa Golf Club, and the Carlsberg Sky Tower. It is also near a metro station. 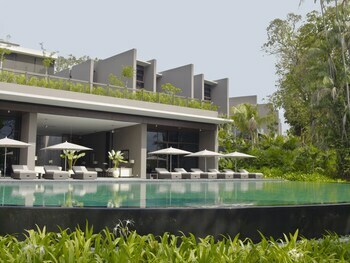 Green-certified Sentosa hotel on Siloso Beach, on an island at the southern tip of Singapore. Underwater World, the Carlsberg Sky Tower, and Images of Singapore are within one-half kilometer. 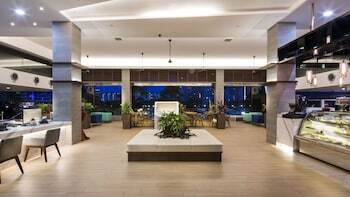 Located on the east side of Sentosa Island, W Singapore - Sentosa Cove is a 25-minute drive from Singapore City. 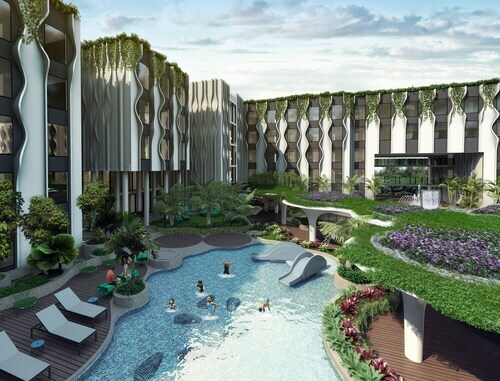 Guests can drive 6 minutes to Tanjong Beach, or 10 minutes to Resorts World® Sentosa, Universal Studios Singapore®, and MegaZip Adventure Park. 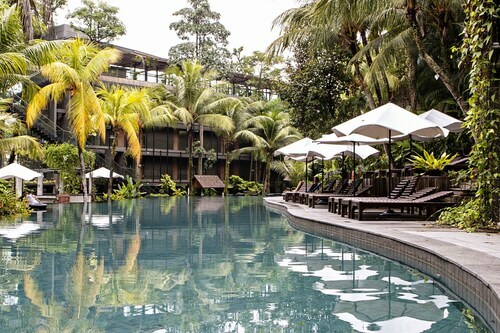 Situated in Singapore, this resort is within a 10-minute walk of Madame Tussauds, Adventure Cove Waterpark, and Sentosa Luge. Wings of Time and Siloso Beach are also within 15 minutes. 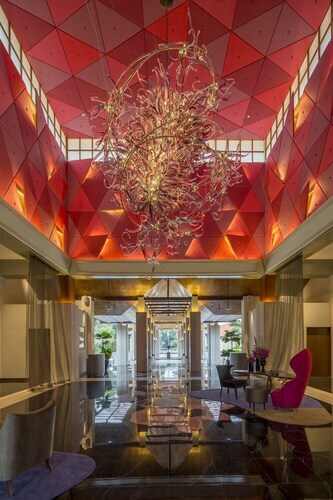 Situated in Singapore, this luxury hotel is within a 15-minute walk of Adventure Cove Waterpark, Madame Tussauds, and Sentosa Luge. Universal Studios Singapore™ and Wings of Time are also within 1 mi (2 km). From the hotel it's a 5-minute walk to Universal Studios Singapore and Marine Life Park, which houses the world's largest oceanarium. The nearby monorail connects to the MRT network, and the suspension bridge at Palawan Beach enables guests to stroll to the southernmost point of continental Asia. The property is also in close proximity to Sentosa beach, KidZania Singapore, and Madame Tussaud's Singapore. Sun., 23 Feb. - Mon., 24 Feb.